I will be 40 on Sunday. Not sure how to feel about that. Hopefully I get at least 40 more years and I get to hunt for most of them. We plan on going out to dinner Saturday night and probably chase some birds either Saturday or Sunday. The other day we’ll spend with the kids and my mom. I’ve told everyone no gifts since I’m spoiled enough as it is. Brian over at Ultimate Upland wrote a post this week about slowing down as a hunter as we age http://www.ultimateuplandnews.com/upland-with-friends/. Charles and I have been discussing the same thing this year. I can remember being in our 20s and how we would hunt all day, then party for most of the night back home in Valentine for several consecutive days. Over the years, the beers have become fewer and evening hours have grown shorter progressively. I’ve actually given up drinking altogether as of two months ago (I’m making it official here on the blog since I’m going to stick with it this time). I hope that is enough oversharing for everyone this week. 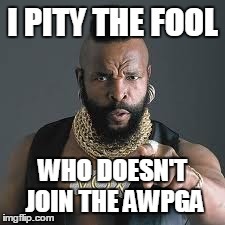 Mr. T says so http://awpga.com/index.php. Since you get to read my blog free from advertising, with the exception of the junk WordPress puts at the bottom, I am going to start plugging AWPGA membership. Especially those of you who own griffs and do NAVHDA testing. Now that I’m working on the Griffonnier and Charles and I are starting to help with the field committee, I see that probably less than 10% of those prizing are AWPGA members. We are going to change that. Plus, we are looking to get more AWPGA sponsored field events across the country. I am very excited to be helping out the elders who have been doing this for a long time and using my blog as a way to help get the word out. AWPGA Database: I have not yet added my litters to the database, but will have done so by the next time I post to the blog. That will allow any of my puppy owners to add health and title information. Griff owners can add information at http://awpgadb.com. This is not only for AWPGA members, but any griff owners. I was out of commission last weekend with a cold, but Charles and his friend, Matt, made it out into the field with Fire and BB. Charles got a rooster and the world’s smallest quail and Matt got two roosters. 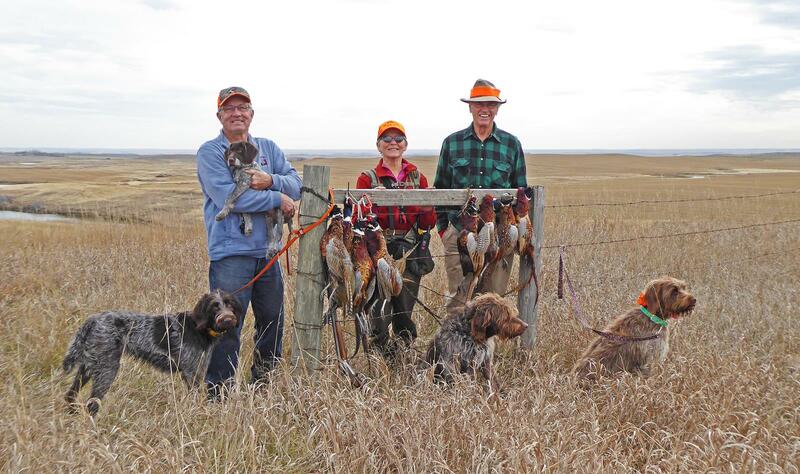 Sounds like last weekend was beautiful up in North Dakota and there were plenty of birds to be had. 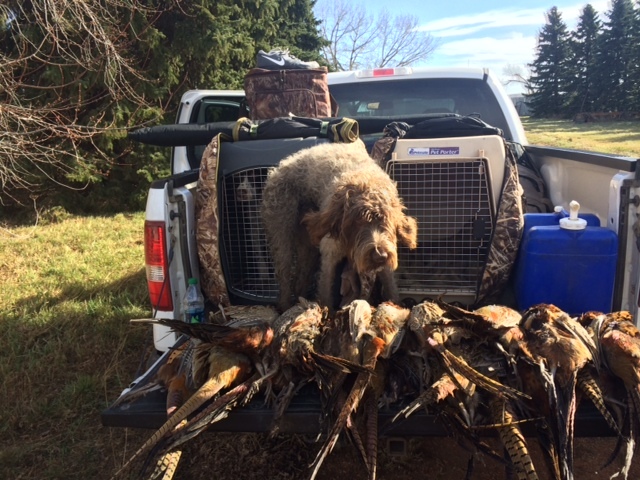 Ernie, Duncan and a large party of fellow hunters and dogs found a mess of roosters! Duncan is from our 2014 “H” Litter between Sam and Mae and is 7 1/2 months old. Of course, TracHer, Susan, and Tom are out chasing roosters again. They were joined by Jim Borg, participant in the 2014 NAVHDA Invitational and owner of VC Agate Hill’s Akeeta (who had to sit out of the hunt due to injury). TracHer on point. She is from our 2012 “C” litter between Sam and Mae. Close up of TracHer and Max on point. TracHer, Tom holding Max the GWP pup, Susan, Max the griff, Jim, and Zepher. Field work consists of a search, pointing, steadiness, backing and retrieving with the dogs being run in braces. 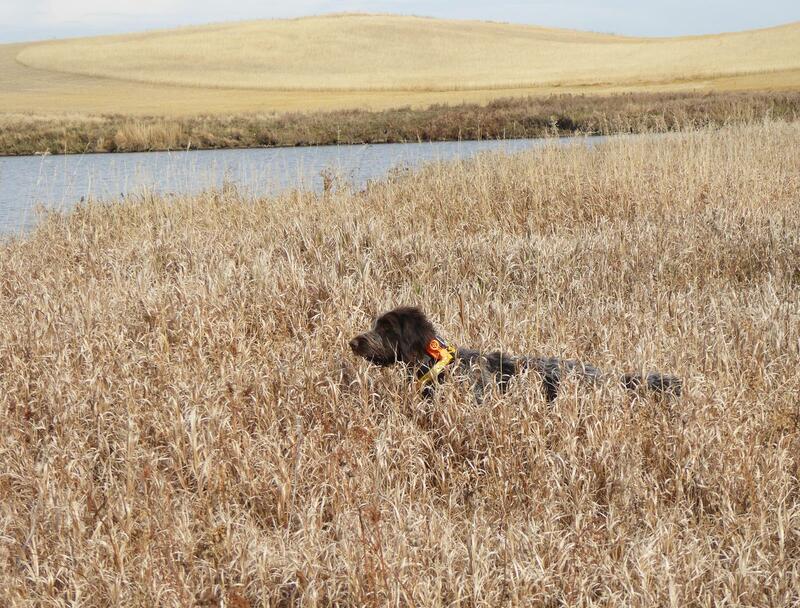 Water work consists of a blind retrieve, double-marked retrieve and honoring a retrieve. Cooperation, obedience, desire and nose are judged throughout the entire test. Dogs successfully completing the Invitational Test with a passing score will receive the title of “Versatile Champion,” further recognized by placing VC before their names. Susan does such a great job keeping me in photos! I hope to make it up to a Central Dakota Chapter NAVHDA Test one of these years so that I get to meet all of these great griff hunters who are members up there. 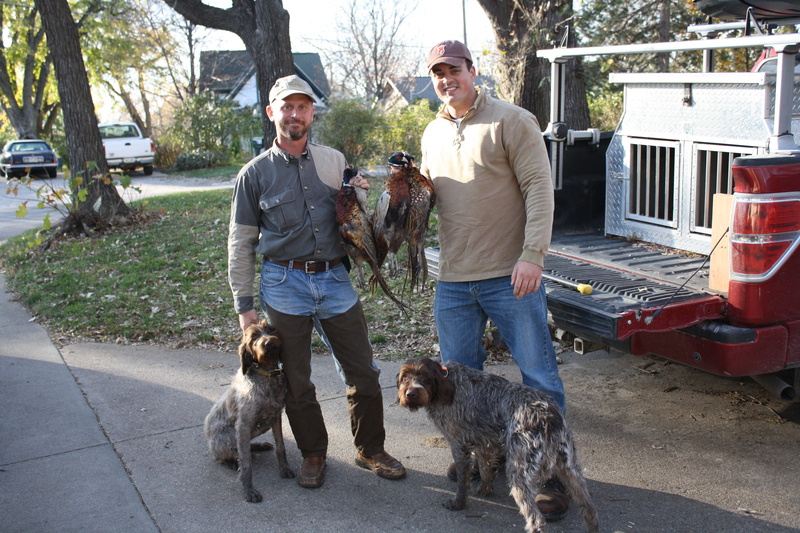 We work on upland, waterfowl, fur and tracking. This morning I shot a doe and she tracked it about 100 yards. I was so proud of her, even though it appeared to be super easy for her. We start duck season next weekend, so with a deer in the freezer we can concentrate on what she/I love the most. We moved this summer to a house on ~6 acres. It’s fully fenced and she is a hunting machine. 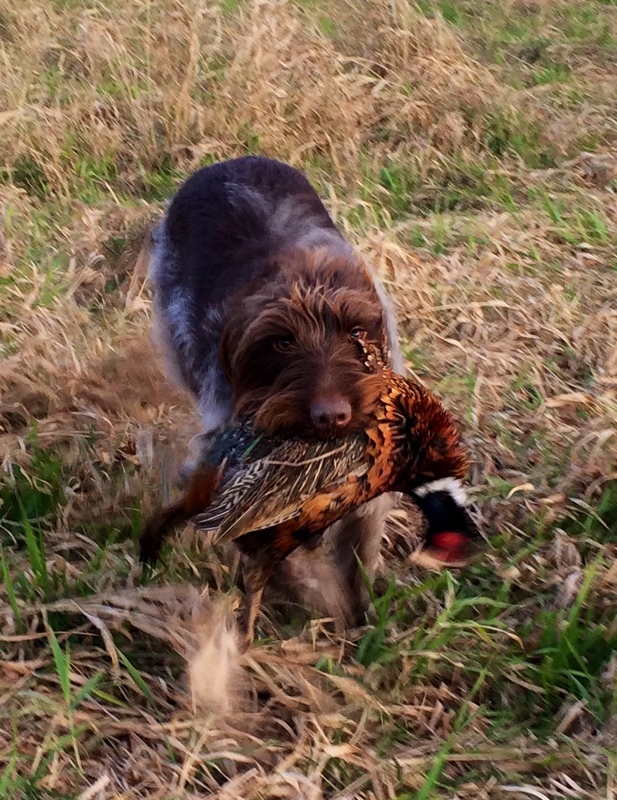 She spends so much time hunting at full throttle that I was remiss in her training for a couple of months. We have stepped up our effort and she is getting back to her old obedient self. That is so cool, we have never used our griffs for blood tracking big game, but it is one of their historical purposes and it is great to see one of our owners out there doing it! Maggie is doing fantastic. 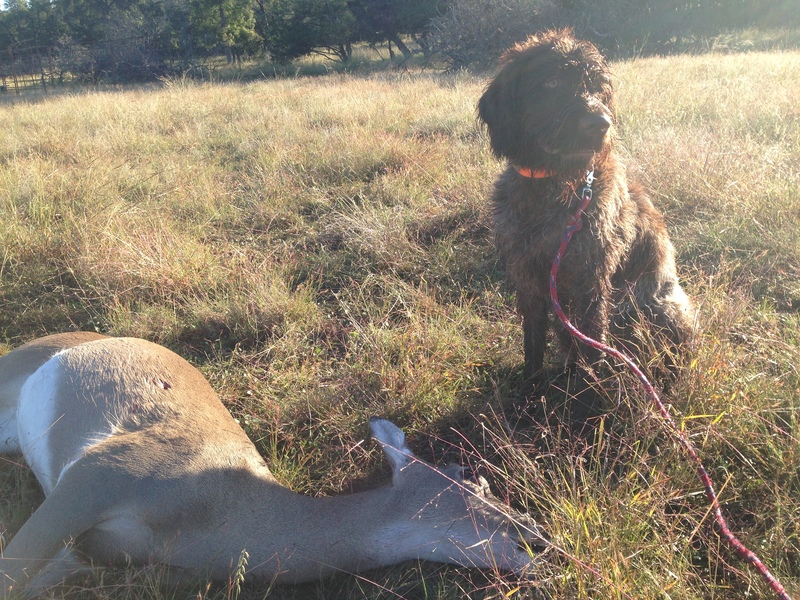 She hunted last year at 9 months and our hunting friends were shocked she was that young, because of how well she did. 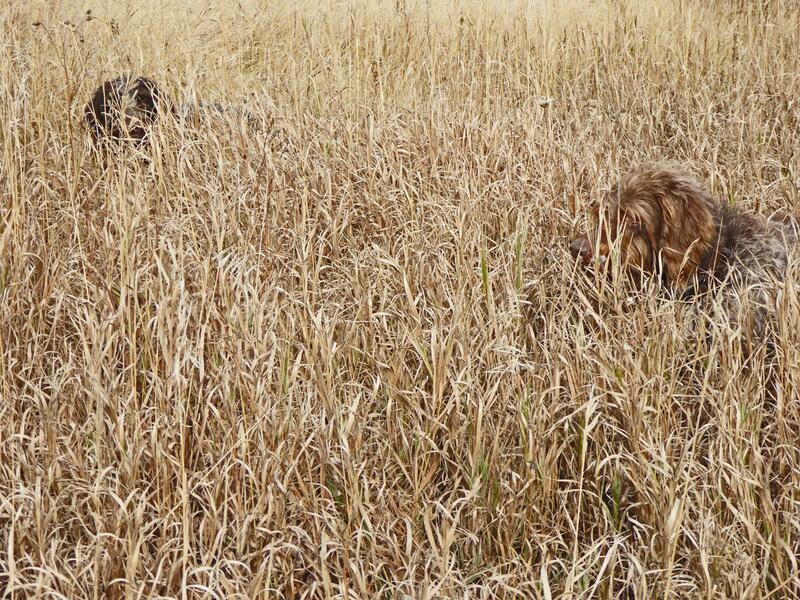 Since then we have been training all the time, in the hope that she will be better at hunting than I am at training!! And it’s going well. 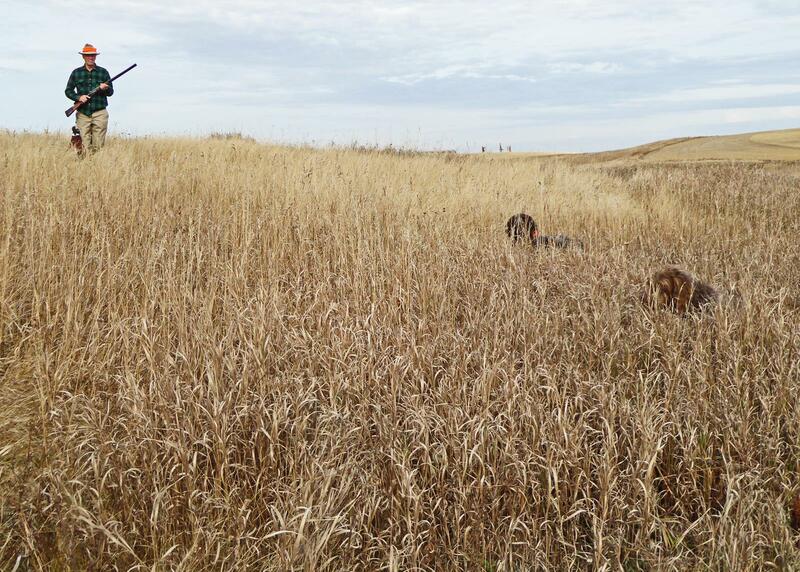 This is us working on retrieving, and hopefully I will get some great photos, or maybe video, after we spend next week in Winner, SD chasing those roosters. Wow, owners, thanks for all of the great updates! The day is getting away from me and I need to fix supper. I have some big projects due for grad school coming up, so I don’t know if I’ll be back in one week or two. But God willing, I’ll be back. Talk at you then.